Each summer since 2002, the city of Paris has brought a slice of the Mediterranean to those unfortunate enough to be â€˜stuck’ in the city of lights and not able to escape to the coasts of France. This year, from July 20th to August 20th, the beach returns. 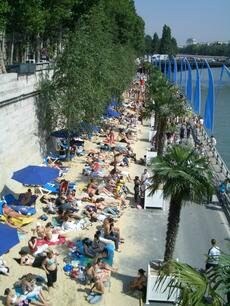 Over 3 kilometers long, the beach is divided into 3 main areas, the Louvre to Pont de Sully, the Port de la Gare, and the Bassin de la Villette. Each is divided into different activities and areas of entertainment. The Louvre to Point de Sully is the â€˜original’ Paris beach. There is a swimming pool, and tons of outdoor activities like wall climbing and even tai chi to keep oneself entertained. The Port de la Gare is considered the intellectual option, as it is loaded with free newspapers, a temporary library, and art classes. Don’t forget your laptop, because there is also free wi-fi here. The Bassin de la Villette is the newest beach offering and includes most of the boating activities, where one can test his or her rowing, kayaking and pedal boat skills.